MATTHEW 5:14 KJV "Ye are the light of the world. A city that is set on an hill cannot be hid." 11Blessed are ye, when men shall revile you, and persecute you, and shall say all manner of evil against you falsely, for my sake. 12Rejoice, and be exceeding glad: for great is your reward in heaven: for so persecuted they the prophets which were before you. 13Ye are the salt of the earth: but if the salt have lost his savour, wherewith shall it be salted? it is thenceforth good for nothing, but to be cast out, and to be trodden under foot of men. 14Ye are the light of the world. A city that is set on an hill cannot be hid. 15Neither do men light a candle, and put it under a bushel, but on a candlestick; and it giveth light unto all that are in the house. 16Let your light so shine before men, that they may see your good works, and glorify your Father which is in heaven. 17Think not that I am come to destroy the law, or the prophets: I am not come to destroy, but to fulfil. Yee are the light of the world. A citie that is set on an hill, cannot be hid. You are the light of the world. A town put on a hill may be seen by all. 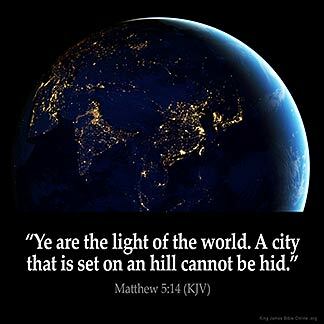 *Ye* are the light of the world: a city situated on the top of a mountain cannot be hid. *You* are the light of the world; a town cannot be hid if built on a hill-top. 5:14 Ye are the light of the world - If ye are thus holy, you can no more be hid than the sun in the firmament: no more than a city on a mountain - Probably pointing to that on the brow of the opposite hill. Mt 5:14 Ye are the light of the world. The business of the church is not only to save, but to enlighten. Christ is light, and his disciples must be light. A city that is set on an hill. Anciently cities, for the sake of defense, were placed on hills. Such cities are seen from afar. So must the church give forth its light. Good verse, if a city is built on a hill, that means everyone can see it. As a child of God, we are always being watched by everyone. We must follow Jesus steps. I think it 's hidden code for the church not to get caught cheating, lying, or stealing from the sheep. This is my anchor scripture. God bless his word that can and will never lie, Amen! How about adding a couple of buttons that permit me to navigate to verse 5:13 and/or 5:15?